Upon receiving them Robin and I both put our bracelets on. We noticed at first how stiff they were but after a few days of wearing they've loosened up a bit and we are now wearing them comfortable almost every where we go. Upon adorning our bracelets, the big kiddo, as if on cue, whined, "Where's mine?" Well how can you deny that type of plea from an almost 16yo who has a thing for bracelets. She is in love with hers by the way. We all have to take ours off however if we are holding the bug, as the velcro sometimes want's to catch her leg or the buckles tend to poke her in the legs. We've not had a chance to actually use the bracelets for any of the purposes intended, but it's nice to know that if we ever find ourselves in a situation that calls for a length of rope, we will always have some at the ready. The large and small bracelet are both made of 550 Paracord with 7 inner strands braided and covered with a tightly woven sheath. The code has a 550lb break strength and is produced in the USA by a U.S. Government Contractor. With that being said, you can guarantee the quality of the cord lives up to the 550lb claim unlike Chinese produced cord. The large bracelet measures 7.5 - 8.5 inches in length by 3/4 inch wide and has a total of 8 - 9 feet of rope. The small bracelets that Robin and the kiddo have measures 6.5 - 7.5 inches in length by 1/2 inch wide and has a total of 5 - 6 feet of rope. Both are equipped with velcro straps, great for adjusting the bracelets to an appropriate fit for your wrist. For the large bracelets, there are 15 colors to choose from and 12 for the small bracelets. In addition to the bracelets, as mentioned early, we also received matching colored key chains. 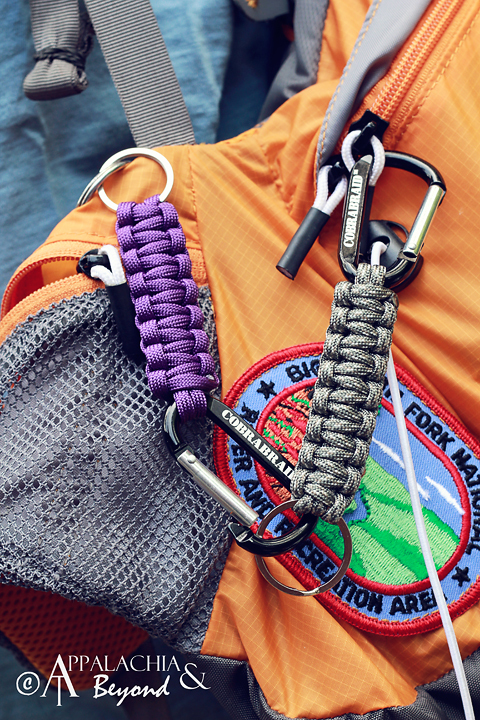 The key chains come complete with small carabiner for clipping, a key ring and paracord braid that measures 6 inches by 3/4 inches which contains approximately 4 feet of rope. There are 20 different colors to choose from with the key chains. 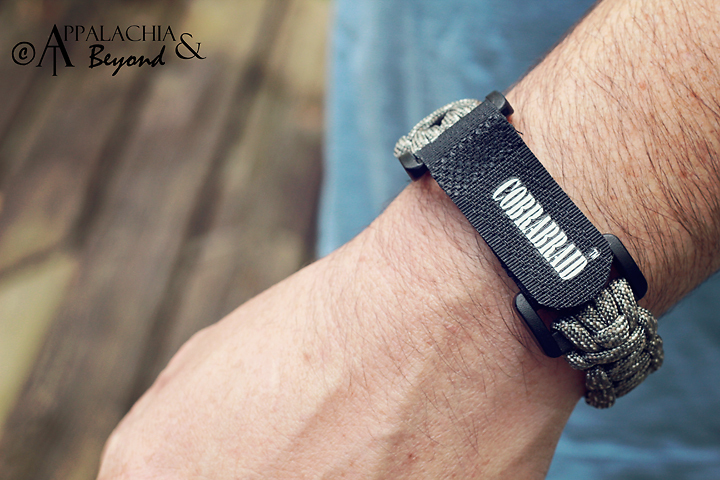 The Cobrabraid survival bracelets and key chains look pretty easy to unravel and the uses are many. Replace boot laces, fishing line, tie up a tarp, make a snare, or my personal favorite, string up an antenna for ham radio use. On top of all the uses, you'll look cool and all survivalist type wearing them. You'll be the envy of all your friends. Disclaimer: Tim and Robin received the Cobrabraid Survival Bracelets and Keychains from Cobrabraid for review purposes only. Appalachia & Beyond are in no way affiliated with Cobrabraid and are not being compensated by Cobrabraid for this review.. The opinions expressed above are Tim's and Robin's independent thoughts and experiences.